It’s the Tuesday before Thanksgiving – my absolute favorite time of year. Who would have guessed that a vegetarian Indian girl who never even really acknowledged the holiday until 1991, would be this obsessed. I hear my husband saying it’s all him. He’s the reason I love it. Maybe. Memory: Aunt Dee Dee (whose real name is Mary inexplicably) handing me the sausage to cut up for stuffing. First time I ever touched sausage. Good times. For years we went to her house every year – even right after my little baby girl was born. Speaking of baby girl – she came home for the holiday. 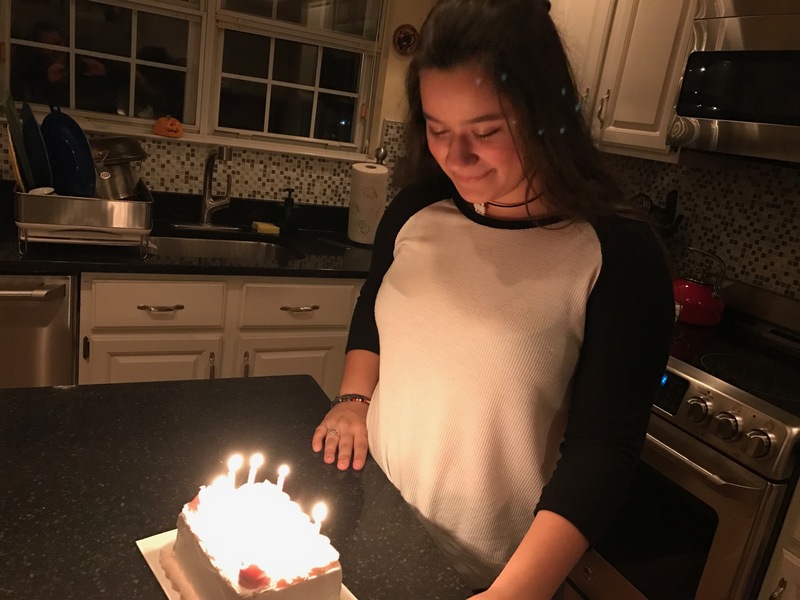 On her 18th birthday. We missed cake for breakfast so we did cake at a normal time. 18. As in a year younger then I was when I went to my first Thanksgiving in Milford. This is some twisted time warp. But she’s home! And by home I mean she’s out with friends but in the same town as us. I’ll take it. We also saw some oldies but goodies. Katherine. Howard and Luigi. Santa. And Janey. The picture says it all. It’s blurry. Off center. Everyone’s smiling – even Howard – he’s the bald head floating on top of Janey. (On a side note) Katherine has her tree up. We have neighbors who have lights up. I know it’s tradition but I’m still rocking the pumpkins. I need to hold on to pumpkins people. And that is in no way a diss to Christmas-on-Thanksgiving people. You do you. So anyway it’s the Tuesday before…Thursday and all through the house, not a creature was stirr… that’s not true. Creatures are stirring. They’re stirring all over the place. Turkey #1 is in the brine! Do you brine? Do you dry rub instead? Do you do none of the above and your turkey comes out better then mine? Don’t tell me. I brine because I’m a sheep to The Food Network. If Ina tells me to do something – by god I do it. 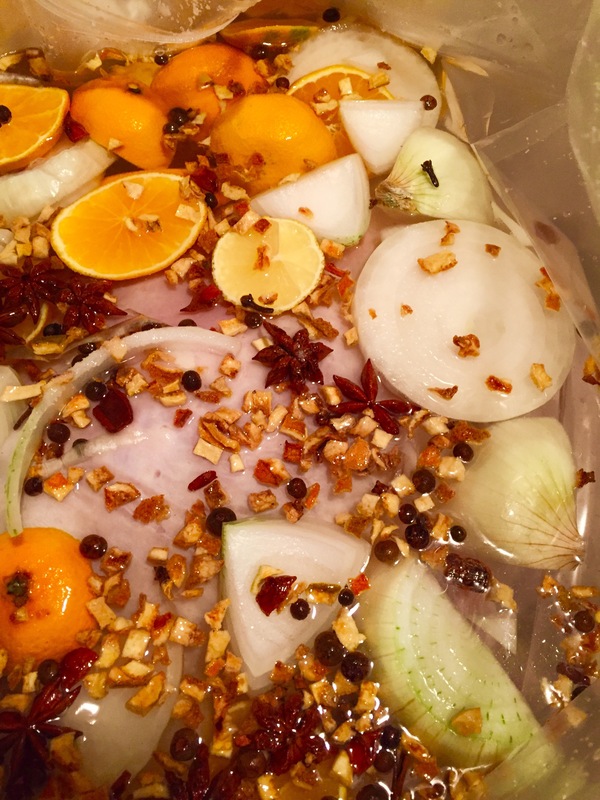 My brine is a combo of mulling ingredients and things I’ve heard are good to dump in there. Yes that is star anise in there. And yes, also some dried apples and pepper cloves. Citrus? Yep. Onions and garlic? Yep. Good turkey. Nice turkey. What do I care – I’m not eating it! Just kidding.. And now something that has nothing to do with anything but is just as important. I want to share a photo taken by an amazing photographer(among other things) in our town – who as fate would have it just happened to be my baby girls soccer coach in middle school. Small beautiful world. 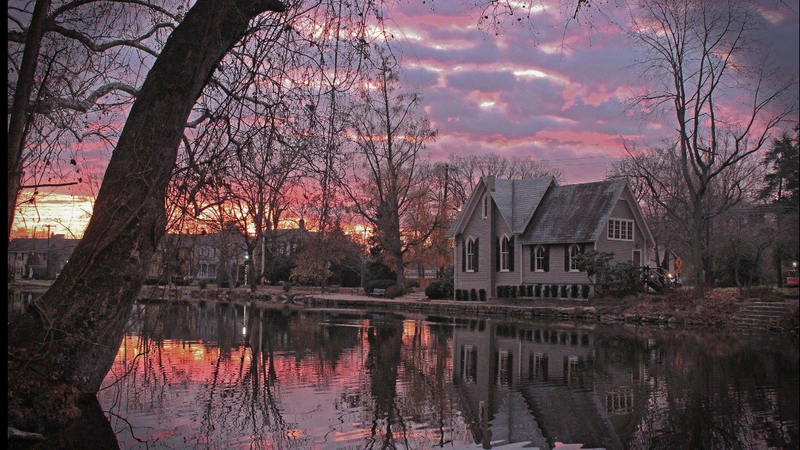 He took this pic of the lake in our town. I screenshot (or is it screenshotted? Is that even a word?) it a week ago and have been looking at it ever since. I was totally going to pretend that I took it – but he’s too nice a guy. Thanks Pat for sharing your talent! Thanksgiving week is on – and in the words of Jim Morrison or Mandela or Bobby Flay…the only way out is through. Let’s do this. I love a good apology. It makes me feel good to hear. I even feel good when I’m the one that’s apologizing – and I’m always happy when I hear about others mending fences. I grew up in a quiet house where there was no fighting. Just undercover seething and anger. My husband grew up in a loud house. With lots of raised voices and disagreements. Both not great. When we got married we vowed to be different, we weren’t really. We fought. He yelled, I seethed. And then one of us would apologize, we’d vow to never to do it again (silly) and we’d move on. 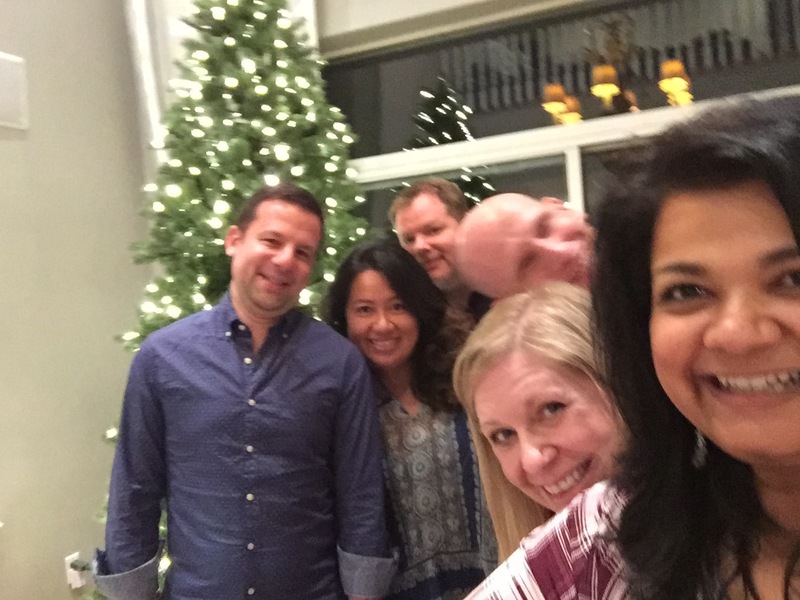 When we had kids we vowed again to be different – and we were….for a while. But the reality of life is that you will get mad. You’ll say things you don’t mean. You’ll be hurtful, or will get your feelings hurt. But now the kids are there. They’d hear all the anger, all the harsh things that each of us would say in the heat of the moment. And of course we’d apologize to each other eventually. We’d move on. But it would be done very differently than the fight. It would be done quietly. Softly. Usually out of earshot of the kids. I’m not sure that was the right thing to do. Wouldn’t it have been great for our kids to hear us apologize as loudly as we fought? I mean, they figured it out, they knew things were better but they didn’t see how they got better. Channeling my inner Carrie Bradshaw I ask this simple question…”Why aren’t we as loud with our apologies as we are with our fights”? Although come to think of it – my kids are pretty quick to apologize. And they aren’t ax murderers yet, so maybe it wasn’t all bad. Remember me? No? I don’t blame you. It’s been a few days, or weeks or maybe months (ouch). I just haven’t been in the mood. Every form of social media that I used to love and get excited to be a part of became a vehicle for me to voice my frustrations. About what you ask? Well, you know what. Tuesday, November 8th is what. And since the middle of the year I’ve been caught up… in it…with it. Up to my neck. Who knew I was so civic-minded? Not me – my priorities (outside of my family of course – I’m not a monster) were usually my DVR rotation and what I was having for my next meal. But I got hooked. And it felt great. And I did and do and will always believe in it. But I’m exhausted. A friend texted me the night of the election and said she was gutted. That’s the perfect word for how I felt too. Gutted. Not just by the results, but by the ride. And when I woke up the next day and hopped a train to work – I felt like a zombie. But then I started seeing friendly faces. Talking. Laughing. Commiserating. My team and I literally broke bread (NYC bagels) together the morning after and talked about how we all spent the night before. It felt great – and it wasn’t just the sugar from the carbs hitting our system. It was hearing about plans for the next weekend. Complaining about upcoming meetings and joking about family. Now, a few days out, I’m coming out of the fog. And it doesn’t hurt that the leaves are bursting with psychedelic color and my favorite cooking shows are all focused on Thanksgiving (I don’t even mind the Christmas commercials already airing). So I’m going to start a cleanse. And this cleanse has nothing to do with kale or juicing. I haven’t lost my mind. I’m going to stop indulging and eating up the news. I’m going to stop soaking up opinions and articles and shows about the state of the world. You’ve heard me say that I love Facebook – or I used to. I loved seeing posts from friends and family near and far about their daily lives and what they were up to. But in the last year, the news feed that used to make me happy has either incited me or validated my opinions. I’ve felt the need to read and absorb every single good/bad/hurtful/helpful thing that comes up. And it’s depleted me. I joined a local group of supporters who felt like I feel and think like I think and I thought it would make me feel better. But it didn’t. So I’m cleansing and purging. I deleted all my posts that were political in nature – and the comments good and bad that followed. If I thought for a second it would feel like a copout – it didn’t. It felt great. I also hid every single person on my news feed that posts constantly about their political/social views – whether I agree with them or not. I would never unfriend them – but now I only see what they post when I want to. I realized a lot of my actions were reactions to other people. That can’t happen anymore. Instead my newsfeed is full of people who post dog pics, their latest cooking ventures and what they did the night before. If you checked in to a good restaurant last night, I want to know about it. If your kid’s team won – I want to cheer him on with you. Does that mean I don’t care anymore? No.I care a lot. None of my views have changed. Not one. I still believe in every single vote I cast. And I’d do it again (I will for sure in 4 years). But I have never been a fighter. I’m not into it. I don’t enjoy making someone feel bad. I’ve worked hard to only have people in my life that make me feel good – make my family feel good. Passion is good, but it needs balance so it doesn’t become rage. And I value kindness above all other things. Period. I don’t always succeed, but I try. So I’m going to focus on Cranbury sauce recipes and whether I should add buttermilk to this year’s mashed potatoes, is that a crime? I’m going to put all my brain power where it belongs – on a new brine recipe for the turkey. Furthermore! I need to start thinking about Black Friday….will I or won’t I? I’ve been ignoring these major decisions for too long.